Brain and spinal cord tumors are abnormal growths of tissue found inside the skull or the bony spinal column, which are the primary components of the central nervous system (CNS). There are two general types of tumors found: benign tumors are noncancerous (do not spread), and malignant tumors are cancerous and have the ability to spread, or have spread from somewhere else. Benign tumors are generally slow growing, with distinct borders that can be cured by surgical excision. The central nervous system (CNS) is housed within rigid, bony quarters of the skull and spinal column, so any abnormal growth, whether benign or malignant, can place pressure on sensitive tissues and impair function. It is important to understand the source of the tumor and whether a tumor is benign or malignant. Tumors that originate from the tissues of the nervous system are called primary tumors. Primary tumors can be of the malignant or benign variety. Most primary tumors are caused by out-of-control growth among cells that surround and support neurons, such as astrocytomas; a broad class of common primary brain tumors. In a small number of individuals, primary tumors may result from specific genetic disease (e.g., neurofibromatosis, tuberous sclerosis) or from exposure to radiation or cancer-causing chemicals. The cause of most primary tumors remains a mystery. Tumors that originate from different parts of the body (e.g. lungs) and spread to the nervous system are called metastatic tumors (to the brain or spinal column). Occasionally, a metastatic brain tumor that is discovered in the brain or spine is the first indication that there is cancer in another part of the body. The most common brain metastatic tumors are cancer of the lung (about half of all metastatic brain tumors), skin, breast, and gastrointestinal tract. 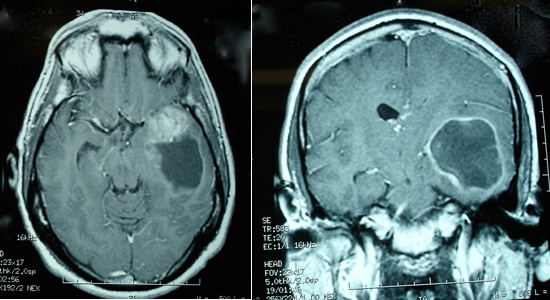 Treatment of metastatic tumors focuses on the treatment of cerebral edema, headache, and seizure. Multiple factors, such as number and size of the lesions, location, status of the main disease, and patient life expectancy are considered before surgery is offered. Symptoms of brain tumors vary and can include headaches, seizures, nausea and vomiting, vision or hearing problems, and behavioral, cognitive, motor, and balance problems. The symptoms related to spine tumors can vary from local pain to pain that shoots down an arm or leg. There may also be additional symptoms, such as weakness, loss of extremity sensation, or bowel and bladder control problems. The first test to diagnose tumors is a neurological examination. Special imaging techniques (Computed Tomography – CT, and Magnetic Resonance Imaging – MRI, Positron Emission Tomography – PET) are also often employed, as are laboratory tests including the EEG and spinal tap. MRI scan is a test using magnetic fields (no radiation) to make computerized images of the brain or spine and detect tumors. CT scan is a three-dimensional x-ray that takes series of detailed pictures. PET scan involves injection of a radioactive glucose substance followed by imaging. Cancer cells react to the glucose and provide information about the level of metabolic activity. PET scan can be used to detect cancer metastases. While there are many potential types of tumors, including benign or malignant, primary or metastatic, there are several more common types of tumors that are briefly outlined below. GBM is the most common and malignant of the glial tumors (Figure 1) that account for about 60% of all primary brain tumors diagnosed in adults older than 50 years. Symptoms depend on the size and location of the tumor. The standard treatment has been unchanged for many decades; surgical resection to resect as much tumor as safely as possible followed by radiation and chemotherapy. Unfortunately, even if the most aggressive treatment is attempted, the prognosis is usually unfavorable. There are few promising therapies being developed for GBM treatment. One such experimental treatment is a vaccine therapy, which in combination with chemotherapy, could double the average survival for the patients. Tumors express certain receptors and if a tumor over-expresses the receptor called EGFRvIII, the patient is more responsive to the chemotherapy treatment. This vaccine targets EGFRvIII protein and strengthens the immune response in fighting the tumor. This type of tumor arises from the meninges; membranes that surround the brain and spinal cord. The majority of these tumors are benign grow very slowly, and may never require any treatment. 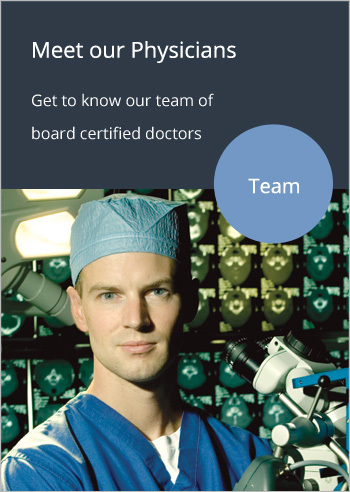 If treatment becomes necessary, open surgery has long been considered as the standard choice. These recommendations have been changed since introduction of stereotactic radiosurgery as a noninvasive treatment alternative for these tumors. With 95% / 5-year control rate and low complication rate, radiosurgery is the new “gold standard” treatment for meningiomas. Moreover, in the publication by Colombo et al. (Neurosurgery, 2009) it was described that the use of the CyberKnife expanded indications for radiosurgery to include more that 30% of patients that could not have been treated with framed-based radiosurgery systems (e.g. LINAC, gamma knife). Acoustic neuromas are benign tumors of the VIII cranial nerve; the vestibulocochlear nerve. The typical location is the angle between the cerebellum and the pons in the posterior fossa. Symptoms include hearing loss or deafness, tinnitus, a loss of balance, but unilateral hearing loss usually is the most common symptom present at the time of diagnosis. Rarely are acoustic neuromas associated with Neurofibromatosis Type II; a rare genetic condition. Patients with Neurofibromatosis Type II develop tumors on both auditory nerves. Treatment depends on the tumor size, age, and clinical status of the patient. The goal is to eliminate the tumor while preserving neurological function. If surgery is necessary, BNA surgeons have options to offer to patients, including microsurgical removal or stereotactic radiosurgery. Pituitary adenomas are tumors located next to or within the pituitary gland. Almost all pituitary adenomas are benign. The symptoms depend on tumor size and the hormone it secrets. The surgical removal of pituitary tumors is performed via one of two main approaches: craniotomy or transspenoidal. Click this link to read more about this type of surgery. Squamous cell and basal cell tumors that originate in the orbits, salivary glands, oral cavity, larynx, pharynx, sinuses, and other locations can lead to intracranial extensions of tumor. These tumors tend to spread into the skull base and ultimately, the brain. Symptoms are site-specific and mainly depend on the adjacent structures. Surgical resection of these tumors requires a multidisciplinary approach and neurosurgeons that are experienced in skull base surgery. Recent advances in endoscopic techniques have made possible less invasive access to these tumors and have had a dramatic impact on overall outcomes by reducing mortality, preserving neurological functions, and improving overall prognosis. Many tumors that were previously deemed inoperable are successfully treated using such minimally invasive techniques.